LOS ANGELES — His head coach, Tim DeRuyter, says he’s the kind of guy that does it in every area. USC interim head coach Clay Helton went as far as to say he’s the best quarterback in the nation. As far as numbers go, Helton’s right. Nearly 12 years after his older brother, David, helped Fresno State earn a reputation for being giant killers and eventually becoming the No. 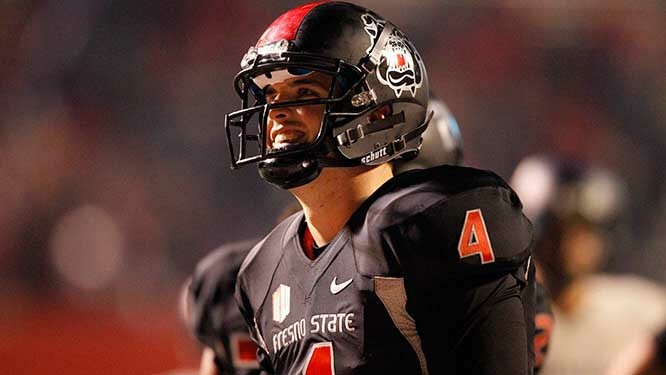 1 overall pick in the NFL Draft, Derek Carr had the Bulldogs knocking on the door of the BCS. Fresno State came up just shy of that feat, dropping a 62-52 tilt to San Jose State the day after Thanksgiving. But it wasn’t because of a lack of contribution from Carr. The senior threw for 519 yards and six touchdowns in a losing effort. Fresno State bounced back to defeat Utah State, 24-17 in the Mountain West Conference title game. “It’s going to be a challenge,” safety Dion Bailey said of his teams task of defending Carr. The Trojans are 31st in the nation allowing 214.5 pass yards a game. Fresno State is the No. 1 pass offense in the country and Carr leads the nation with 4,866 yards through the air. “When you see a quarterback out there like that, you just have to give him his props, he’s just able to have fun and compete as well,” said USC linebacker Hayes Pullard. The Trojans still aren’t quite sure how they’re going to slow down Carr and the Bulldogs explosive offense. The team will have three days off for finals. When they return to the practice field on Saturday, the coaches will look to start installing a gameplan to try to tame the Bulldogs. Carr has two 1,000-yard receivers as weapons on the outside in wide receivers Davante Adams and Josh Harper, who combined for 36 touchdown receptions in 2013. Carr, who’s also the 2013 National Football Foundation National Scholar Athlete, has 48 touchdown passes on the season and just seven interceptions.